The Alumni Committee has decided to forgo the usual money raffle this year and instead take on a project to help Blessed Trinity. The recent sale of the old school building has necessitated removal of the church/school bell located in the building’s bell tower. The combination church/school building opened in 1907, and two years later the 1,200 pound bell manufactured by the McShane Bell Company in Baltimore, Maryland was installed in its bell tower. It was customary for a church bell to be given a saint’s name, and Blessed Trinity’s bell — a gift of parishioner Helen Eckard — is named after St. Cecilia, the patroness of musicians. Your only recollection of the bell may be a nun’s stern warning not to touch the bell rope hanging outside the third floor gym. However, from its installation in 1909 until the dedication of the new church in 1928, it was recognized throughout the neighborhood as a call to pray the Angelus and a summons to Sunday and Holy Day Masses. The bell has not been rung on a regular basis for almost a century. If you attended the 2006 reunion Mass, the bell was rung at that time, and it has not tolled since until Trinity Sunday of this year when alumni from the classes of 1958 and 1975 did so in recognition of the 90th anniversary of the dedication of the “new” church. 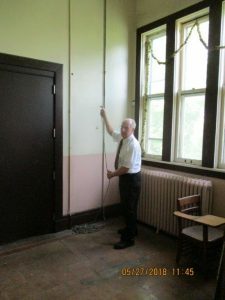 Blessed Trinity is working with the Verdin Bell Company and John Cozzarelli, the new owner of our former school building, to facilitate removal of the bell, probably in early September. 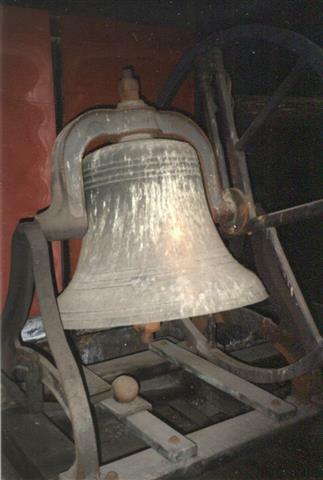 The present plan is to have the bell repaired and restored at Verdin’s facility in Cincinnati, Ohio, and then brought back to Buffalo for placement on the parish grounds. The church will then once again be able to use the bell and preserve an important part of its past. Obviously this removal and restoration project comes with a cost. The parish is fortunate to have covered a portion of the expense thanks to Mr. Cozzarelli and a fortuitous donation from a couple who happened to attend a Sunday Mass and wanted to help with the project. The Alumni Committee believes that we could fund the balance of this project as a lasting gift to the parish from its school Alumni. We are hoping that you will agree. If you would like to contribute to the bell project, please make your check payable to Blessed Trinity Alumni and specify “bell donation” on the memo line of the check. Checks may be mailed to “Blessed Trinity School Alumni, 317 Leroy Avenue, Buffalo, NY 14214. Donors’ names will be displayed in the church and on the church’s web site. (Written acknowledgements will also be provided if required by IRS Regulations). We hope you will join the members of the Alumni Committee in making this campaign “a bell ringer”!